For the uninitiated, the Hector Lassiter novels usually incorporate historical events and figures, including Ernest Hemingway, Orson Welles, and myriad other 20th-century luminaries who interact with the main character. The series returns this month, though not with just a single new novel, or with a re-launch of the previously printed four entries centered on crime novelist and screenwriter Lassiter, “the man who lives what he writes and writes what he lives.” Instead, European publisher Betimes Books will unveil the entire series of Lassiter novels, released in an aggressively accelerated combination of “old” and new titles. Within a matter of just a few months, the whole of the Lassiter saga will be available for the first time. I’m fairly certain we’re headed into uncharted publishing territory here, strategically speaking. But then the Hector Lassiter series has always been a genre maverick. 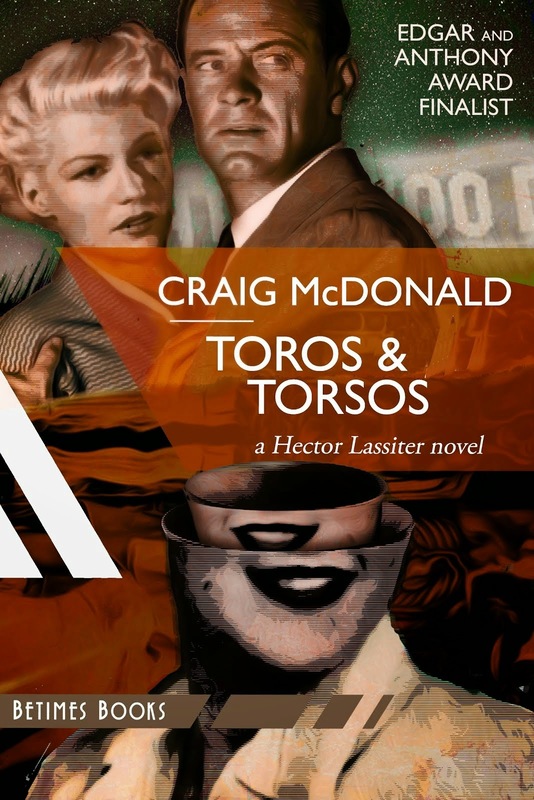 In a kind of premonition of this unusual publishing schedule, the Lassiter series was written in rapid-fire fashion, one book after another, long before the original second novel in the series, Toros & Torsos, was even contracted for publication. I had written the books with an eye to an overarching storyline that would bind the series into a larger tale focused on Hector’s life journey and climaxing with the mystery of whatever became of Hector, the author and the man. After all the first drafts were completed, I went back over them en masse, polishing and pulling the series together in meticulous detail. To be clear, while other authors carry a series forward one book at a time, I plotted and wove the Lassiter novels together to form that larger story, from the jump. Several of the individual Lassiter installments sprawl across decades. So a novel here may at points intersect or overlap with a novel or even two over there. Most series treat life as a chain of compartmentalized episodes, each book standing more or less alone. Real life more closely resembles an oil spill, of course. Events and episodes bleed together. I aimed to come closer to that mixing of mile-markers in shaping the Lassiter series. At conception, it seemed this strategy allowed readers to tackle the novels in any order they chose. In their original publication sequence, the “first” Lassiter novel, the Edgar Award-nominated Head Games, opened in 1957. Its sequel took flight in 1935. The third novel, Print the Legend, explored the death of Ernest Hemingway and was largely set in 1965. The fourth, One True Sentence, was a Lassiter/Hemingway origin story, of sorts, set in 1924 Paris. But as the series extended to four published novels, increasing numbers of new readers reached out, craving a recommended reading sequence. A striking number told me they wanted to read the novels in something approaching chronological order. I came to see readers’ attitudes toward Hector were dramatically affected by which Lassiter novel they read first. When Betimes proposed publishing the entire series in a concentrated burst, and it was suggested we present the books in something like chronological order, I immediately embraced the notion. Strictly speaking, the fact that some of the novels cover three or more decades makes truly chronological presentation of this series an impossibility. We’ll therefore be offering the novels in order of when each book opens. In this new publishing sequence, One True Sentence--a story encompassing one week during February 1924--is now novel No. 1. 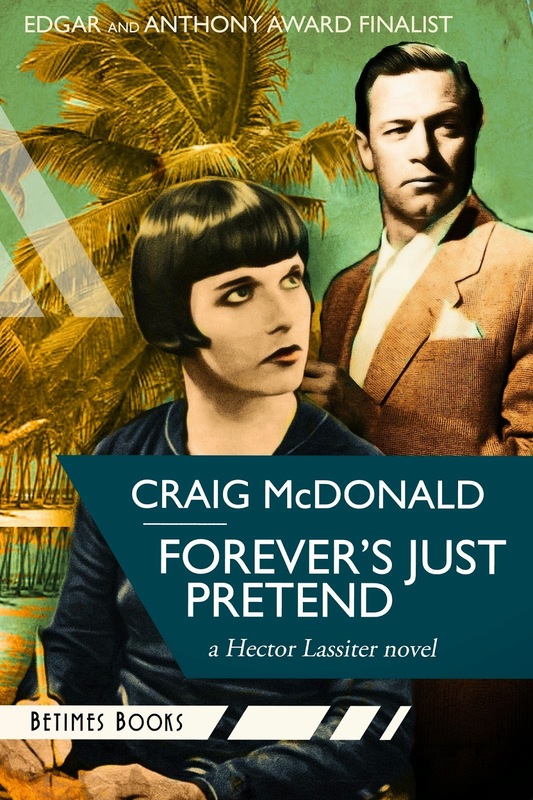 OTS was released last week, followed by its never-before-published sequel, Forever’s Just Pretend, which is set across successive holidays in Key West, Florida, circa 1925. Those two installments will appear simultaneously with a re-release of Toros & Torsos, which opens in 1935. A few weeks later, two more previously unpublished, World War II-era Lassiter novels will debut: The Great Pretender (1938) and Roll the Credits (1942). The remaining novels, a similar mix of old and new installments, will quickly follow. I wrote an essay for The Rap Sheet about One True Sentence when the novel debuted in February 2011. That tale traces aspiring novelists Lassiter and Hemingway as they confront a cult of nihilist artists. One True Sentence also introduced the character of Brinke Devlin, a fetching female mystery author who resembles sultry screen siren Louise Brooks but writes like Craig Rice. Brinke was established in OTS as the woman who shaped or even “created” the Hector Lassiter we come to know. The previously unseen Forever’s Just Pretend delivers on the promised Hector-Brinke reunion teased in the final pages of One True Sentence. Forever’s Just Pretend breaks the Lassiter template in significant ways. Most notably, for the first time, there are no historical figures; the focus is kept squarely on Hector and Brinke. Also, for the first time, we meet a Lassiter blood-relative. This new novel introduces Hector’s paternal grandfather, a thinly veiled homage to a beloved, recently passed actor who helped inspire the meta-fictional, sometimes irreverent tone of the Lassiter series. While no overt historical personages haunt the pages of Forever’s Just Pretend, the crimes that drive the plot are based on a real cycle of murders and arsons that rocked 1920s America. Now, here’s a challenge to all you Lassiter series readers: the first three people who can correctly identify the inspiration for the “Key West Clubber” killings in Forever’s Just Pretend will be rewarded with signed and numbered copies of the now über-rare, limited-edition hardcover version of Toros & Torsos, complete with the “booking sheet” for yours truly and a personalized fingerprint. Submit your answer in an e-mail note to jpwrites@wordcuts.org. And please be sure to write “Key West Clubber Contest” in the subject line. We’ll let you know when we have our three winners.